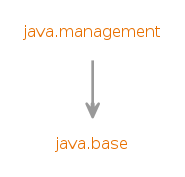 The JMX API consists of interfaces for monitoring and management of the JVM and other components in the Java runtime. Provides the classes which implement advanced dynamic loading. Provides the definition of the monitor classes. Provides the definition of the Relation Service. Interfaces for remote access to JMX MBean servers. Provides the definition of the Timer MBean. A provider for creating JMX API connector clients using a given protocol. A provider for creating JMX API connector servers using a given protocol.